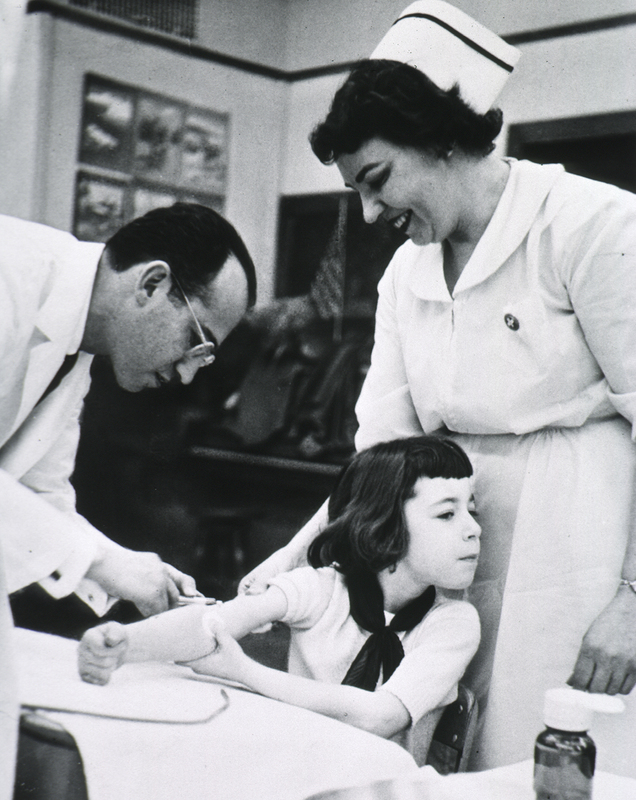 In this black and white photograph from the 1950s, a nurse stands by while Jonas Salk inoculates a young girl with the polio vaccine via injection to the arm. Poliomyelitis (Polio), a disease that attacks the nervous system and causes paralysis, was a widespread epidemic in the United States during the 19050s. On March 26, 1953, Jonas Salk, an American researcher and Virologist, announced that he had successfully tested a vaccine against the virus that causes polio. This first successful polio vaccine, known as inactivated poliovirus vaccine (IPV) or Salk vaccine, contained the killed virus and was given by injection. In 1954, massive testing of the vaccine in clinical trials was used on nearly two million school children nationwide. The vaccine was announced to be safe and effective in 1955, the same year the vaccination was licensed, leading to the wide distribution of the vaccine to children in the United States. In the following years, after a nationwide inoculation campaign promoted by the National Foundation for Infantile Paralysis, the annual number of polio cases fell from 35,000 in 1953 to 5,600 by 1957. By 1961 only 161 cases were recorded in the United States, where the disease has since been eradicated. Dueling vaccines, Salk vs Sabin. The Salk vaccine was the first out, it was very successful in preventing polio but required 3 subcutaneous injections at intervals from 2 to 18 months. It was immensely popular, then it was followed by the live Sabin vaccine which only required one oral dose to convey immunity. This feature lended itself to immunization programs in remote areas of the world where it was difficult for the health care worker and patient alike to appear the required 3 visits that the injectable ( Salk ) mandated.The Sabin because of its convience soon supplanted the Salk as the vaccine of choice, at least in the developed world. The Salk was 100% effective, but with the Sabin a very miniscule number of patients actually developed polio, because it was a live vaccine. Since absolutely no polio developed with the Salk it once again became the vaccine of choice, which it is today. The Sabin is still used in specific circumstances such as in difficult to access areas of the world, also when rapid immunization is required as with urgent travel to areas when polio exists. Thanks for the comment and the information. We really appreciate it.